For the past year, I've been working on my pet project called the Baywalk pop-up. Over time I've recruited an internationally acclaimed architecture firm and collected an assortment of public endorsements, funding and finally a true partnership with the City. Here's how I did it and how you can do it in your City. 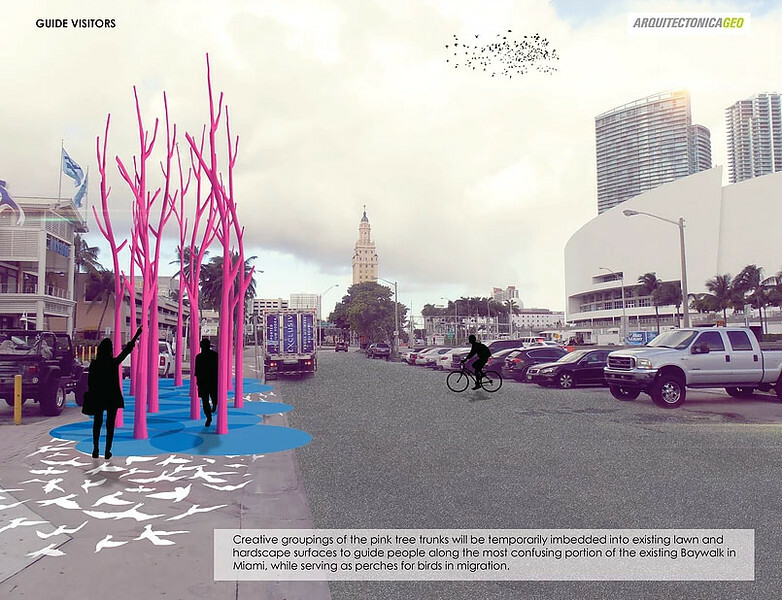 Mine was improving public access to downtown Miami’s urban waterfront with a cool and fun, temporary art installation. Maybe you didn’t know but the Baywalk is already a thing. All the waterfront restaurants like Epic and Cippriani that overlook Biscayne Bay are separated by a 50 foot wide path which the City required them to build. In fact, all new construction (and most old) have some version of this path. The problem is that in several places the path is incomplete, think about the old Herald site and some of the bridge crossings. An even bigger problem is that none of these paths look or feel the same. They have no signs and do not exist on any map or public website. They feel private. I didn’t get it. Why wouldn’t the City try to make this a real waterfront? It seemed so obvious. 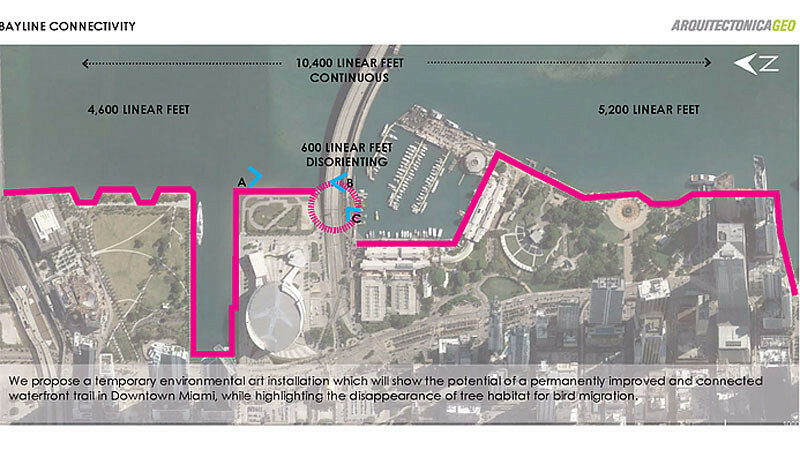 The more I investigated, the more I realized how complicated it was to create one beautiful waterfront path on property that was not owned by the City. Each property has a different public or private owner. That’s when the lightbulb went off. Let’s pick one location so everyone can see how cool the waterfront could be with a little imagination. I picked the PortMiami bridge shown above. There’s actually a footpath underneath this bridge (images B and C) which connects the back of American Airlines Arena (image A) to Bayside Marketplace. It’s a haven for homeless and fairly unsanitary at times, but who wouldn’t blame the homeless for wanting a spot with a view! Before assembling my team, I pitched the idea to the Florida Department of Transportation. They owned the bridge and the area beneath it. They were so excited about the project that they helped me convince the Miami Parking Authority to sponsor the project and handle all of the tough parts like permitting, insurance and construction management. I partnered with ArquitectonicaGeo, the international landscape architecture firm and sister to Arquitectonica. They shared my passion for the waterfront and developed a comprehensive design scheme for the path. 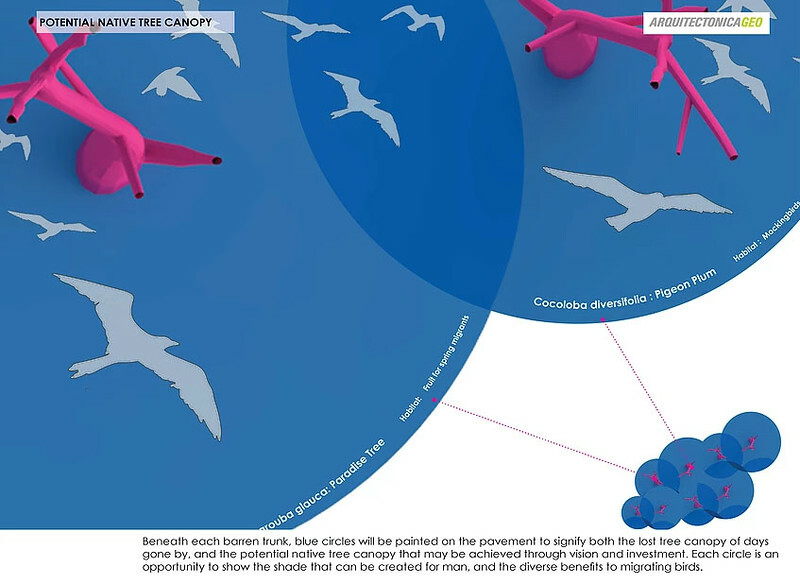 Bottom line, migrating birds have nowhere to roost on their last stop before reaching the Bahamas because we keep ripping out the trees, without replacing them. The pink tree trunks are a kind of a two dimensional cartoon. The installation suggests, if these were real trees, they’d provide a place for birds to roost AND a canopy of shade which are shown as large blue circles painted on the pavement below.